Suppose you're a Master level checker player. You're at a tournament and suddenly you find yourself matched with someone who held the World Championship for many years. An intimidating prospect? Certainly you're good, but this guy is good. Now, imagine instead that you're in the Minor category? You're still in all likelihood a pretty good player, but ... two games against Alex Moiseyev? Would your instinct be to make a hasty exit from the tournament room, maybe even to catch the next flight to some remote location? Or would you stick it out, expecting to take your lumps and just hope you don't look too bad? This was almost exactly the prospect faced by Watson Franks, who told us a story of courage and accomplishment from which we can all learn something. Watson didn't run; he sat down and played. Watson sent us a very interesting and detailed account of his adventure, and while we can't run it all in our weekly columns, we'll put it online in its entirety at the conclusion of this two-part series. "This past October, 2016, my wife encouraged me to go to the Alabama State Tournament ... at the beginning of the tournament ... they decided they wanted to do a Round Robin ... 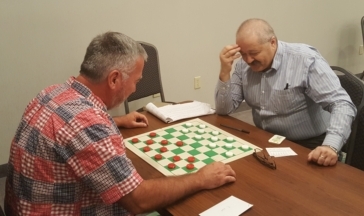 The Master Players realized that in order to have a Round Robin Tournament, they would need to have eight players ... they only had seven signed up ... I volunteered to move up ... They were appreciative ... very few thought I would get a draw, much less a win against any of the master players." In the final round, though, he was inevitably matched with Alex Moiseyev. Did he panic? "Alex and I sat on the far side of the room. There was no one around us. It was very quiet. Alex shuffled the 3-move opening cards. In my mind, I knew it would be a good opening. By good opening, I mean one that I was very familiar with. Sure enough, the opening was 11-15, 24-19, 15-24. A 'Go As You Please' opening!" 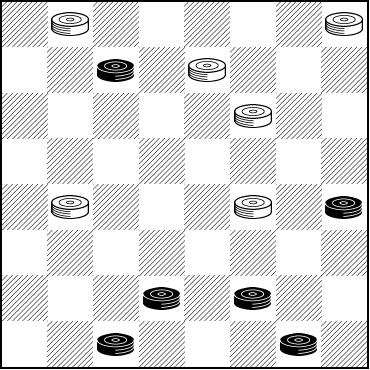 In the first game, Watson had Black and Alex had White. End of KingsRow opening book. May lose; 20-16 was correct. Gives away the advantage; 6-10 might likely win. 14-9 would have been a sure draw. "The game reached a turning point. I thought I had (a) decent position. I was pleased with my shape. I knew what my next move would be. It looked very good for me. He (Alex) looked at me and said, 'Would you like a draw?' I looked at the board for a bit. I said to him, 'If you think this is a draw, then it’s a draw. But I think I have very good shape.' He said, 'It looks drawish.' Of course, I could have kept playing if I had wanted to do so. It was my choice to accept (the) draw. I could have made a bad move and lost the game. But at the point of draw, I realize now that I had (a) winning position. I was very proud of that game." So what do you think? Could Watson have won the game? What about his fear of possibly making a poor move and losing? Black to Play, What Result? Study the position, and when you're done, click on Read More for the answer to these intriguing questions. After the seemingly obvious 27-31 then 14-9 6-10 9-6 would be a draw. 7-11 also does no better than draw. The win here isn't necessarily easy to find. Here 7-11 might look good but also only draws: 7-11 16-7 3-10 18-14 10-15 etc. Black Wins. Watson could have defeated the former World Champion! But it's what happens over the board that counts, not what happens in the notes. What about Watson's fear of blundering and losing? That seems unlikely to have happened. Is a draw a fair result? The over the board win certainly is neither obvious nor simple to find. If it had been us, we would have taken the draw and been very happy with it. Next month, we'll present the second game in Watson's match with the champ.